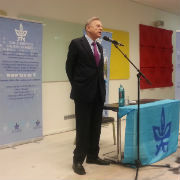 Leaders and members of the German Friends of Tel Aviv University and TAU Honorary Doctors were among the attendees of an event held for the benefit of the European Studies Program – a unique, quadrilateral master’s program run jointly by Tel Aviv University, the Palestinian Al-Quds University, the Jordanian Royal Scientific Society and Germany’s Heinrich Heine University in Düsseldorf. The event, entitled “Strengthening Cooperation: German Support for the Middle East,” was held at the Foreign Ministry in Berlin in the presence of Her Royal Highness Princess Beatrix of the Netherlands; German Foreign Minister Dr. Frank-Walter Steinmeier; former Israeli Ambassador to the EU and head of the program Avi Primor; TAU President Prof. Joseph Klafter; TAU Vice President Raanan Rein; Rector of Heinrich Heine University Prof. Dr. Anja Steinbeck; senior representatives from other universities; notable civic and business leaders; and cultural figures such as Plácido Domingo and Daniel Barenboim. Also speaking at the event were program students – an Israeli, a Palestinian and a Jordanian. The students’ passion for their studies shone through, as did their enthusiasm for a program that aims to bridge cultural and religious divides. All three emphasized that they chose to study in the program because of its cooperative ties with the other partner universities. 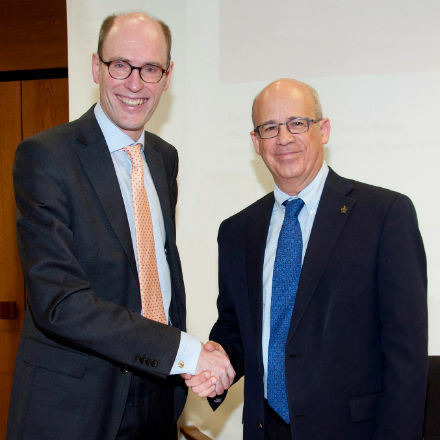 The European Studies Program was launched in 2004 on the initiative of Avi Primor, His Royal Highness Prince El Hassan bin Talal of Jordan and Palestinian philosopher and Al-Quds University president Prof. Sari Nusseibeh. Its aim is to train Jordanian, Palestinian and Israeli students as specialists in the politics, economics, history and culture of Europe and the EU. Its added value involves forging friendships among students that could serve later on as an important basis for peace and reconciliation in the Middle East. During the first year of their studies, students take the same courses at their respective universities in Tel Aviv, East Jerusalem and Amman. In the second and final year of the program, 30 students are awarded full scholarships to enable them to study together in Dusseldorf. This intensive study period, including group trips to Brussels, Strasbourg and Vienna, is invaluable for strengthening ties among the students. Among funding sources, major support for the program comes from Volkswagen and the State of North Rhine-Westphalia.